Burgers & Suds opened up rather quietly in mid-February 2013 with very little fanfare replacing a burrito spot. A friend of mine ate at Burgers & Suds during National Hamburger Month in May and gave it a ringing endorsement so I added it to my “Burger Queue”. A couple of months later Jeff Eats visited and also took a liking to it, that of course meant that it moved up to become one of my must tries. So there it sat for a few months till one day I said to myself, let’s do this. Let’s being the cumulative me of course. 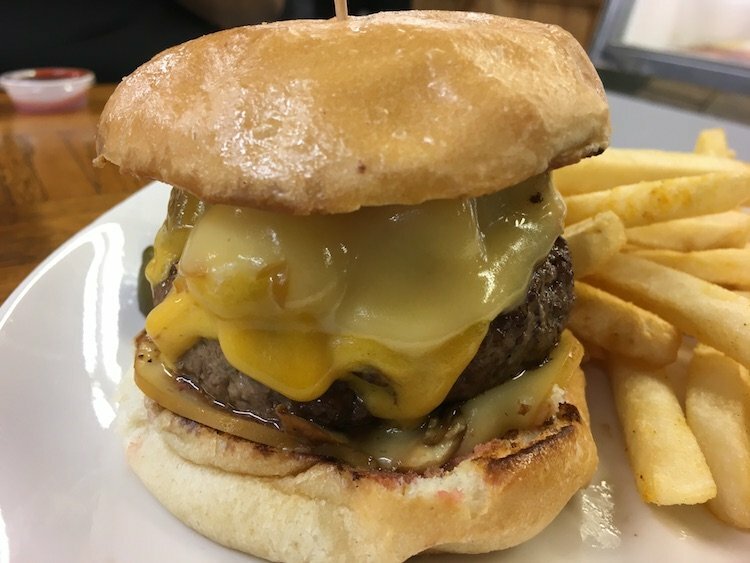 I was really caught off guard by the looks of Burgers & Suds when I pulled up (they have since moved from the original location in Oakland Park to Pompano Beach). It’s in the middle of a renovation, that’s something the owner made sure to tell me when I mentioned that Jeff Eats‘ post brought me there. Yes, it’s divey and a hole in the wall but that also brings with it a charm that endears it more to me than another slick overly thought out Burger restaurant. I had done my homework before driving up from Miami and reviewed the menu online. The Pizza & Bacon-wrapped Hot Dogs sounded like great ideas if I had someone else with me, which I didn’t. I settled on their Knockout Chicken Wings tossed in Hot Sauce although they were more like drizzled in it. These were great crispy grilled Wings with a very bright tasting Hot Sauce. I wasn’t more than 3 wings in when my Burger and Fries arrived. My first instincts were to order a Patty Melt. Yes, Patty Melts do count as Burgers regardless of what some folks think. Burger & Suds’ Patty Melt description reads like this: Swiss cheese, sauteed mushrooms, and onions, thousand island dressing, served on marble rye bread. The additions of Mushrooms & Thousand Island dissuaded me from ordering it, I’m a Patty Melt purist. I go with the 1/2 Pounder Burger w/American Cheese and hold the Lettuce, Tomato, Onion & Pickle. The Fries are topped with a nice seasoning that makes me eat them at such a pace that I almost forget there’s a Burger on the plate too. First, bite in and there’s a great crunch coming from the toasted bun. It tastes like an awesome summertime Burger. By that I mean, the char-grilled flavor comes through and puts me in a grilling state of mind. It’s a solid Burger, no complaints here. the new location of burgers and sud on mcnab road pompano is having a problem paying the employees there the checks are bouncing like a ball and the owner is showing any intention of paying them.